Should you, kind reader, visit the noble forests of the lower parts of the State of Louisiana, about the middle of October, when nature, on the eve of preparing for approaching night, permits useful dews to fall and rest on every plant, with the view of reviving its leaves, its fruits, or its lingering blossoms ere the return of morn; when every night-insect rises on buzzing wings from the ground, and the fire-fly, amidst thousands of other species, appears as if purposely to guide their motions through the sombre atmosphere; when numerous reptiles and quadrupeds commence their nocturnal prowlings, and the fair moon, empress of the night, rises peacefully on the distant horizon, shooting her silvery rays over the heavens and the earth, moving slowly and majestically along; when the husbandman, just returned to his home, after the labours of the day, is receiving the cheering gratulations of his family, and the wholesome repast is about to be spread out;--it is at this moment, kind reader, that your ear would suddenly be struck by the discordant screams of the Barred Owl. Its whah, whah, whah, whah-aa is uttered loudly, and in so strange and ludicrous a manner, that I should not be surprised were you to compare these sounds to the affected bursts of laughter which you may have heard from some of the fashionable members of our own species. How often, when snugly settled under the boughs of my temporary encampment, and preparing to roast a venison steak or the body of a squirrel, have I been saluted with the exulting bursts of this nightly disturber of the peace, that, had it not been for him, would have prevailed around me, as well as in my lonely retreat! How often have I seen this nocturnal marauder alight within a few yards of me, expose his whole body to the glare of my fire, and eye me in such a curious manner that, had it been reasonable to do so, I would gladly have invited him to walk in and join me in my repast, that I might have enjoyed the pleasure of forming a better acquaintance with him. The liveliness of his motions, joined to their oddness, have often made me think that his society would be at least as agreeable as that of many of the buffoons we meet with in the world. Such persons as conclude, when looking upon Owls in the glare of day, that they are, as they then appear, extremely dull, are greatly mistaken. The Barred Owl is found in all those parts of the United States which I have visited, and is a constant resident. In Louisiana it seems to be more abundant than in any other state. It is almost impossible to travel eight or ten miles in any of the retired woods there, without seeing several of them even in broad day; and, at the approach of night, their cries are heard proceeding from every part of the forest around the plantations. Should the weather be lowering, and indicative of the approach of rain, their cries are so multiplied during the day, and especially in the evening, and they respond to each other in tones so strange, that one might imagine some extraordinary fete about to take place among them. On approaching one of them, its gesticulations are seen to be of a very extraordinary nature. The position of the bird, which is generally erect, is immediately changed. It lowers its head and inclines its body, to watch the motions of the person beneath, throws forward the lateral feathers of its head, which thus has the appearance of being surrounded by a broad rut, looks towards him as if half blind, and moves its head to and fro in so extraordinary a manner, as almost to induce a person to fancy that part dislocated from the body. It follows all the motions of the intruder with its eyes; and should it suspect any treacherous intentions, flies off to a short distance, alighting with its back to the person, and immediately turning about with a single jump, to recommence its scrutiny. In this manner, the Barred Owl may be followed to a considerable distance, if not shot at, for to halloo after it does not seem to frighten it much. But if shot at and missed, it moves to a considerable distance, after which its whah-whah-whah is uttered with considerable pomposity. This Owl will answer the imitation of its own sounds, and is frequently decoyed by this means. The flight of these Owls is smooth, light, noiseless, and capable of being greatly protracted. Once, whilst descending the Ohio, not far from the well-known Cave-in-rock, about two hours before sunset, in the month of November, I saw a Barred Owl teased by several Crows, and chased from the tree in which it was. On leaving the tree, it gradually rose in the air, in the manner of a Hawk, and at length attained so great a height that our party lost sight of it. It acted, I thought, as if it had lost itself, now and then describing small circles, and flapping its wings quickly, then flying in zig-zag lines. This being so uncommon an occurrence, I noted it down at the time. I felt anxious to see the bird return towards the earth, but it did not make its appearance again. So very lightly do they fly, that I have frequently discovered one passing over me, and only a few yards distant, by first seeing its shadow on the ground, during clear moon-light nights, when not the faintest rustling of its wings could be heard. Their power of sight during the day seems to be rather of an equivocal character, as I once saw one alight on the back of a cow, which it left so suddenly afterwards, when the cow moved, as to prove to me that it had mistaken the object on which it had perched for something else. At other times, I have observed that the approach of the grey squirrel intimidated them if one of these animals accidentally jumped on a branch close to them, although the Owl destroys a number of them during the twilight. 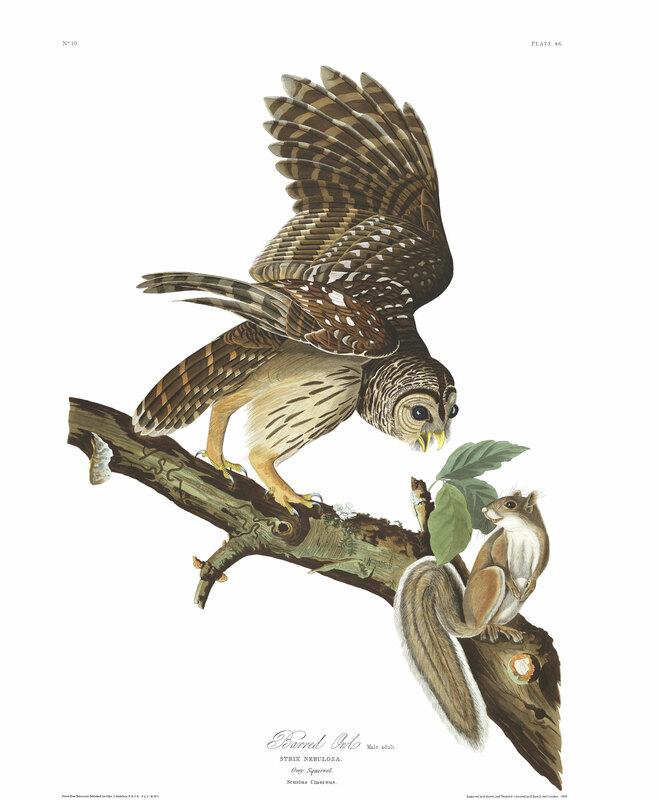 The Barred Owl is a great destroyer of poultry, particularly of chickens when half-grown. It also secures mice, young hares, rabbits, and many species of small birds, but is especially fond of a kind of frog of a brown colour, very common in the woods of Louisiana. I have heard it asserted that this bird catches fish, but never having seen it do so, and never having found any portion of fish in its stomach, I cannot vouch for the truth of the report. About the middle of March, these Owls begin to lay their eggs. This they usually do in the hollows of trees, on the dust of the decomposed wood. At other times they take possession of the old nest of a Crow or a Red-tailed Hawk. In all these situations I have found their eggs and young. The eggs are of a globular form, pure white, with a smooth shell, and are from four to six in number. So far as I have been able to ascertain, they rear only one brood in a season. The young, like those of all other Owls, are at first covered with a downy substance, some of which is seen intermixed with and protruding from the feathers, some weeks after the bird is nearly fledged. They are fed by the parents for a long time, standing perched, and emitting a hissing noise in lieu of a call. This noise may be heard in a calm night, for fifty or probably a hundred yards, and is by no means musical. To a person lost in a swamp, it is, indeed, extremely dismal. The plumage of the Barred Owl differs very considerably, in respect to colour, in different individuals, more especially among the males. The males are also smaller than the females, but less so than in some other species. During the severe winters of our Middle Districts, those that remain there suffer very much; but the greater number remove to the Southern States. When kept in captivity, they prove excellent mousers. The antipathy shewn to Owls by every species of day bird is extreme. They are followed and pursued on all occasions; and although few of the day birds ever prove dangerous enemies, their conduct towards the Owls is evidently productive of great annoyance to them. When the Barred Owl is shot at and wounded, it snaps its bill sharply and frequently, raises all its feathers, looks towards the person in the most uncouth manner, but, on the least chance of escape, moves off in great leaps with considerable rapidity. The Barred Owl is very often exposed for sale in the New Orleans market. The Creoles make gumbo of it, and pronounce the flesh palatable. BARRED OWL, Strix nebulosa, Wils. Amer. Orn., vol. iv. p. 61. STRIX NEBULOSA, Bonap. Syn. p. 38. BARRED OWL, Strix nebulosa, Nutt. Man., vol. i. p. 133. BARRED OWL, Strix nebulosa, Aud. Orn. Biog., vol. i. p. 242; vol. v. p. 386. General colour of upper parts light reddish-brown; face and greater part of the head brownish-white; the feathers of the latter broadly marked with brown, of which a narrow band passes from the bill along the middle of the head; feathers of the back and most of the wing-coverts largely spotted with white; primary coverts, quills, and tail, barred with light brownish-red; wings and tail tipped with greyish-white; lower parts pale brownish-red, longitudinally streaked with brown, excepting the neck and upper part of the breast, which are transversely marked; the abdomen, which is yellowish-white, and the tarsal feathers, which are light reddish.